This set of Linear Integrated Circuit Interview Questions and Answers focuses on “Basic Principles of Sine Wave Oscillator – 3”. 1. 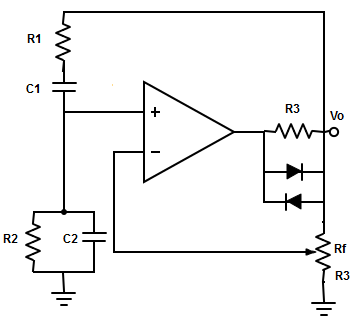 What is the frequency of oscillation of wein bridge oscillator? Explanation: The frequency of oscillation of wein bridge oscillator is fo=2πRC. Explanation: The gain |A|≥3, for oscillation to keep growing ( Since, |Aß|≥1 for sustained oscillation). 3. Determine the value of fo, ß and Rf from the following circuit diagram. => fo = 55.8 = 60Hz. 4. 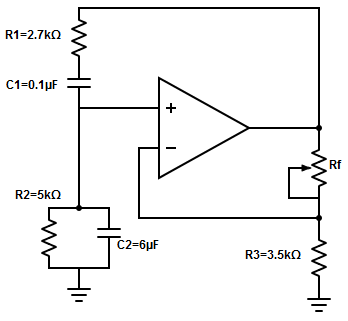 What is the problem faced by the wein bridge oscillator? Explanation: The gain of wein bridge oscillator is greater than 3, sometimes this may keep the oscillations growing and it may clip the output sinewave. Explanation: The circuit shown is the practical wein bridge oscillator with adaptive negative feedback. 6. Calculate the value of capacitance in wein bridge oscillator, such that fo =1755Hz and R=3.3kΩ. => C = 0.027µF = 0.03µF. Explanation: In Quadrature oscillators, signals have same frequency but have phase shift with respective to each other. 8. Which of the following component is not used for audio frequency? Explanation: RC and wein bridge oscillator are suitable for audio frequency range because of size of R and C components becomes very large for generating low frequencies. 9. Find the signal waveform for Quadrature oscillators? Explanation: Quadrature signals are the signals that are of same frequency but have a phase shift of 90o with respect to each other. 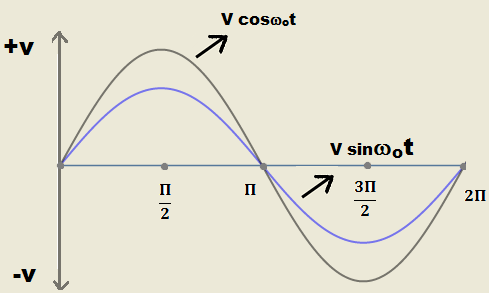 The mentioned waveform have a phase shift of π/2- π=90o phase shift between sine waveform and cosine waveform. 10. If the resistor and capacitor values are same in Quadrature oscillator. Find its frequency of oscillation for R=50kΩ and C=0.01µF. 11. What is the possible method used in Quadrature oscillator to remove distortion from the output waveform? Explanation: The resistor at the input of non-inverting type amplifier is replaced with a potentiometer in order to eliminate any possible distortion in the output waveform. 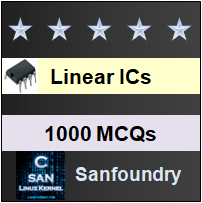 To practice all areas of Linear Integrated Circuit for Interviews, here is complete set of 1000+ Multiple Choice Questions and Answers.